Flood plains of the Ganges, the Brahmaputra-Jamuna, and the Meghna rivers in the basin south to the Himalaya are the home of more than 600 million people of South Asia . In this alluvial deltaic formation, numerous short-medium and a few remarkable long bridges are recognized to be the important fixed links for offering an uninterrupted surface communication infrastructure. All the major cities of this region are to own a planned flyover and expressway networks to further improve the efficiency of countrywide surface corridors. Apart from design, construction and operation aspects; strengthening, repair and maintenance of all these large hardware are coming up as mammoth challenges of time to keep the lifeline resilient against service deterioration and natural calamities. The 17th century 52.7m Masonry Bridge built over the Mir Kadim Canal , Munshigonj , Bangladesh still remains in service for pedestrian and small vehicles. It also gets well recognition as a valuable archeological artifact. The 1.64 km Hardinge Bridge, one of the largest and oldest railway bridges in this region even of today built over the lower Ganges (now known as the Padma), opened in 4th March 1915 gave uninterrupted broad gauge rail connectivity between Darjeeling and Calcutta for the then Eastern Bengal State Railway. It will complete its 100 year of successful service history in 2015 but has to serve even beyond in future. United Nations Economic and Social Commission for Asia and the Pacific (UN ESCAP) recognized the best possibility for Bangladesh to contribute in bridging the Asia with Europe through the proposed Asian Highway and Trans Asian Railway Network. AH1, AH2 and AH41 will be the three most important routes of Asian Highway passing through Bangladesh at the south of the Himalaya to facilitate farthest East ( Japan ) to farthest West (boarder to Europe ) surface connectivity. A recent study financed by the Asian Development Bank (ADB) identifies the necessity to strengthen the bridge link over the Padma at Hardinge Point to facilitate heavy rail movements for future regional and sub-regional connectivity. 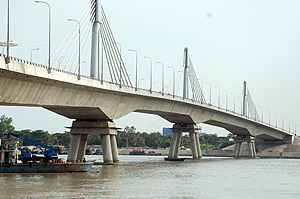 The 4.8 km Bangabandhu Bridge (AH2) over the Jamuna is now under a large scale strengthening scheme as several studies reached a unified conclusion about the structural inadequacy of its as-built system under present traffic and environmental loads. The Meghna Bridge and the Meghna-Gumti Bridge on the N1 corridor (AH 41) underwent emergency repair works recently but can only be strengthened when the Japan International Cooperation Agency (JICA) financed second bridges on this corridor are built. Proposed Padma Bridge (AH1), Jamuna Rail Link (AH2), 2nd Meghna (AH41), 2nd Meghna-Gumti (AH41), 2nd Kanchpur Bridges (AH41), Bhairab Rail Link (AH41) and a large number of small-medium length bridges under JICA financed East Bangladesh and West Bangladesh Bridge Improvement Projects will largely improve future connectivity in this region if the present bridges also effectively remain in service. UN ESCAP recognized the massive demand for investment in the transport sector in Asian regions in terms of infrastructure and services as well as maintenance. Bangladesh is among the countries that are constrained by limited budgets and borrowing capacity. This certainly urges the need for a proper management capability of the existing infrastructure not only through time-bound repair and maintenance schemes but also to undertake strengthening schemes to coup with the next generation demands. Japan Society of Civil Engineers, represented by the Committee of Steel Structures well supported the activities in Bangladesh since 2005 to develop, nourish and culture the discipline of bridge engineering with a view to understanding this rapidly developing society that in the past has well demonstrated for many times the inherent capabilities to recover quickly from large natural disasters. Scholarly discussions were initiated to identify the areas where technical breakthroughs are very much required for future needs and also to identify the areas that can be focused for transfer of appropriate technology. A consensus was reached on the necessities of exchanging ideas through International Events at a regular interval for well founding the knowledgebase and transferring technologies. 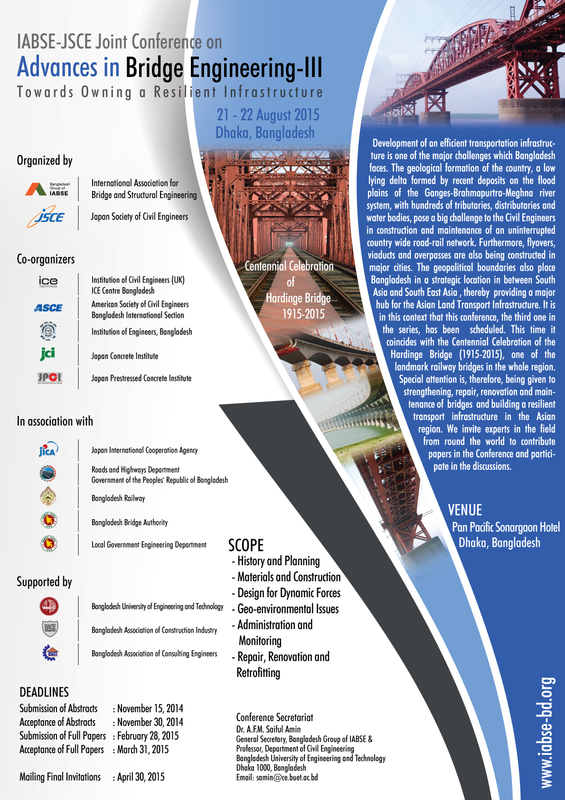 In this line, Advances in Bridge Engineering-I, the first ever conference in Bridge Engineering in Bangladesh was organized in 2005 with 14 contributions, 5 from Japan and the rest from Bangladesh . Steel and composite constructions were given the special theme for that event. 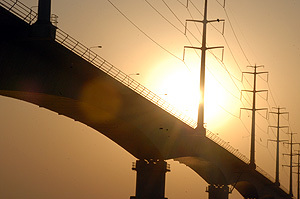 In 2010, after a five year interval, the Advances in Bridge Engineering-II was organized in close collaboration with Committee of Steel Structures, JSCE. IABSE, Switzerland was the other key partner. Six keynote addresses supported by 56 technical papers (13 papers from Japan ) from specialists working in 11 countries made the event successful. Bearings, expansion joints, base isolation system and shock transmission units were given the special attention in theme for that event. The 2015 event, at the five year interval is the next proposed one. This time it falls with the Centennial Celebration of the Hardinge Bridge . This sprits the idea of giving special attention to strengthening, repair and maintenance of the bridge for a owning a resilient infrastructure in the Asian region. The experts from Japan , Europe, Oceania and the neighboring countries are expected to provide in-depth deliberations on bridge forms, architecture, aerodynamic design, vibration and serviceability requirements but giving some attention also to the conference theme. In order to enhance regional cooperation, the conference aims to generate further discussions on the necessity and format of a unified Bridge Code for the Asian countries. It is important to know each others, the technological know-hows, potentials and also the social needs!